We know that shadows are darker areas than sunlit areas, and in space, with no air to scatter the light, shadows can appear almost totally black. Tethys (660 miles or 1,062 kilometers across) is just barely seen in the lower left quadrant of this image below the ring plane and has been brightened by a factor of three to increase its visibility. The wavy outline of Saturn's polar hexagon is visible at top center. This view looks toward the sunlit side of the rings from about 10 degrees above the ring plane. The image was taken with the Cassini spacecraft wide-angle camera on Jan. 15, 2015 using a spectral filter which preferentially admits wavelengths of near-infrared light centered at 752 nanometers. 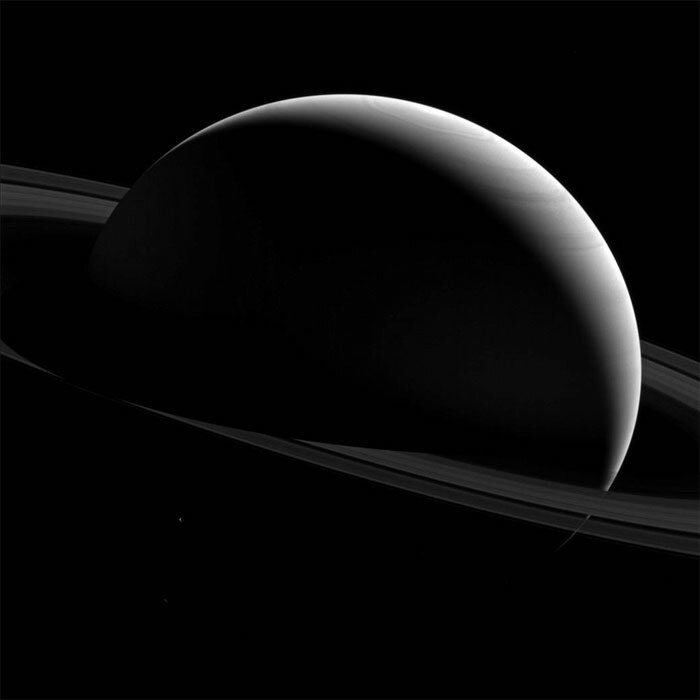 The view was obtained at a distance of approximately 1.5 million miles (2.4 million kilometers) from Saturn. Image scale is 88 miles (141 kilometers) per pixel.